Body hair is one of the greatest enemies of our century. To get rid of it and get ready for summer, men use different grooming and trimming tools. Finding the best manscaping trimmer can be rather difficult when you have so many brands and products to choose from. Wondering how to find the best manscaping trimmer? Well, you have to look at its properties and characteristics first. Then, you have to think about the budget you have at your disposal. To make sure you are choosing from the best, take a look at this list. This way, you will make sure you have made a good choice. Most barbers recommend this tool for trimming body hair, listing it as one of the best products of this kind. The manscaping trimmer is approved and tested by well-known dermatologists. This product is completely safe to trim the hair in sensitive areas. Besides the fact that it is water resistant, it’s also easy to use. It can help you trim, groom and shave in no time with great accuracy. This trimmer is suitable for sensitive areas. It can help you get rid of the unwanted hair and take care of maintenance. However, before shaving, it is better if you moisturize the hair that will be removed to obtain a clean shave. When you want to remove the hair on your back, you could surely trust this trimmer. In only a few minutes, you will get rid of all the hair. This machine is incredibly accurate. Razors and hair removal creams can become a drag. However, with this tool, you will be surprised about the clean shave. The shaving head is very smooth, with a handle that allows you to get the angle you need. Hair removal has never been easier with this incredible trimmer. You will be able to remove the unpleasant body hair from your nose, ear and the rest of the body. You will be thrilled to notice that this gadget offers you a smooth and clean result when it comes to hair removal. Furthermore, it has multi-function usage. This 8-in-1 product comes with a full trimmer, nose trimmer, detail trimmer, stubble comb and a beard and mustache trimmer. This trimmer is waterproof and offers a nice and smooth shave. You can easily use it while taking a shower. Furthermore, it is equipped with an indicator which informs you when the battery runs low. This gadget has extra tough blades, offering you the best performance. By charging it for 5 minutes, you will be able to obtain a full body shave. If you are looking for best electric trimmer for manscaping, this could be it. It has a rechargeable battery and a lithium ion one which is very powerful. The greatest advantage about this product is that it can continue trimming up to 10 times longer. Hence, it provides two times of torque and three times of the runtime. This manscaping trimmer comes with a brow, nose and beard detailer and a T-blade trimmer. This trimmer will work wonders when it comes to shaving the unwanted hair on your back. The product has a unique feature regarding the power burst button. The button is able to remove the coarse and thick hair off the body. Its charge light indicator lets you know when the device is charging. This trimmer is very safe, it prevents skin irritation and is easy to use. When you are desperately searching for a solution to get rid of your unwanted body hair, you should search for an expert’s opinion. Finding the best mens manscaping trimmer, with great features at an affordable price, can be hard. However, you have to keep in mind the fact that quality comes first. If you want to prevent skin irritation and have a smooth shave, then you should pay a bit more and save more money in the long run. You can easily remove the extra hair if you periodically clean the blades of the trimmer to obtain accurate results. Maintaining the device will make it easier for you to maintain and groom your body hair. Harold Simmons is a Professional Barber. He usually works for fashion shows and events. 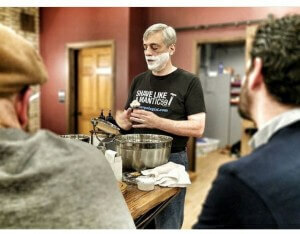 The knowledge he has regarding grooming can be reached on his own website, BestShavingReviews. He started his career from a young age and after years of hard work he has managed to make a name for himself.